Newly updated Kona Bali Kai direct Oceanfront condo Unit 204 on the Big Island of Hawaii only 30 feet from the water. Master bedroom has 8' floor to ceiling windows with ocean view. Fall asleep to the sound of the ocean waves, and when a big wave come in and you are sitting on the lanai, you can feel the ocean spray. If this unit 204 is booked for the nights you want, check out my VRBO listing #48663. This 3rd floor listing is identical to my 2nd floor listing. Has an incredible 180 degree view with the same large lanai etc. Check it out and see if I have your dates there. A second bedroom with a queen bed is available in both units for an additional charge. Ask for more details. Kona Bali Kai Resort is on famous Alii Drive, just 2½ miles south of the quaint town of Kailua-Kona where you will find great restaurants and shopping. From the condo's private lanai you can watch local surfers, and may see see whales, dolphins and turtles..not to mention the breathtaking 180 degree view. Imagine yourself eating dinner on your own private lanai and watching the the famous Kona sunset over the Pacific Ocean. Kitchen with full size appliances and washer and dryer in the unit. Cable TV, DVD player, linens provided, wireless internet in the unit. Free covered well lit parking close to elevator and stairs. From my teen years when I collected Hawaii brochures in a box under my bed to look at and dream at night to owning my own oceanfront property in Kona, I feel like I am living a dream. Please come and enjoy my dream! Every time I came to Hawaii I tried to find something to rent close to the water. When I found Kona Bali Kai I knew I had found my dream place. Every time I am there when I first sit on the lanai I say to myself, "It just does not get better than this." I hope you will stay with me and you will see for yourself what I mean. If you want to be ON the water this is the property for you. Sitting on my large private lanai, you will feel like you are the only person there. If you need time to relax and be quiet you will be free to do that. If you want to leave the lanai (which many guest say they have a hard time doing) you will have a large island to explore from the top of Mauna Kea where you may find snow to the lava flowing underground and down to the ocean from Kileaua. If you want to sit back and relax or delve into all The Big Island has to offer, you will never be bored. Only 30 feet to the ocean from my large private lanai - Fabulous view to watch for dolphins and whales and of course the surfers that are there from sun up to sun down! Absolutely DIRECT oceanfront is NOT an exaggeration! Wade in the tide pools and look for small tropical fish, sea urchins etc. So close to the ocean you can feel the ocean spray while sitting on your large private lanai. Lounge chairs provided. Lots of tidepools for exploring and if you look carefully you will see the sea turtles sunning themselves - but look carefully because they are good at camouflage. 180 degree view of the ocean! Honestly! You won't be disappointed. Condo is only 30' from the ocean. No heat needed in Kona. The cool ocean breeze that comes into the condo from screen doors on each end of the unit is refreshing and makes uses of the air conditioning minimal. Washer and Dryer in Unit. Laundry detergent provided free. Free parking is on the first floor of the building and all shaded so you are not getting into a hot car when leaving. Parking is free and well lit at night when coming home at night. Living room provides a 180 degree ocean view with 8' floor to ceiling windows! Kitchen with full size appliances and enough pots, pans, table ware and bowls to serve a full meal. Dining off the living room but best place to eat is on the lanai with table and chairs provided. Best view in Kona, Hawaii! Often boogie boards, umbrellas, noodle floats, beach chairs, woven mats, etc. left by past guests - check the guest bedroom closet. Besides sand there is a large green grassy area along the beach to lounge on with comfortable lounge chair for your use. Lay in the sun or the shade from the palm trees that line the beach. In Hawaii a balcony is called a lanai. My unit has a large private lanai with table for 4 and 2 lounge chairs for "lounging". Rent these on the island for ocean kayaking or canoeing. Lots of fun! Rent kayaks and paddle to the secluded and protected Kealakekua Bay for the best snorkeling anywhere. For rent in town. Bicycles, mopeds and motorcycles. No boat included but lots of boating, fishing available to rent on the island. Large private deck called a lanai for your enjoyment for lounging or eating a meal. There is a store onsite that rents reasonably priced quality water sports equipment. The best snorkeling on this island and you don't want to miss it! You can find places to go water skiing - or if snow on Mauna Kea locals ski or snow board there. No tennis at the complex but places around town to play. Has an elevator. Door ways in condo are not wide enough for wider wheel chairs. Master bath does have safety bars in bathtub rear and side walls. There is so much to do at this complex and on the island that you will NEVER run out of fun things and you will go home and want to come back soon. It happens to every guest that I talk to. Great place to stay if you are interested in lots of chilling. The lanai is spacious and looks right over the ocean. We watched surfers daily, saw dolphins and turtles. The tide pools are great fun to explore. You are close enough to downtown Kona to easily drive for dinner. There is an airconditioner in the bedroom but we did not use it at all The ocean breezes coming in through the lanai doors was more than adequate to keep us cool. There are fans in the bedroom, living room and on the lanai that also contribute to the pleasant breezes. We did not use the barbeques, but saw many people out there grilling. They were always clean and in good repair. It was great having the under building parking. We would return to this condo in a heartbeat! Very nice accommodation. Loved being on the ocean front. This is an older proprty but very well maintained. Very quiet. We loved this condo, the ocean view, the lanai and the other amenities! We loved our stay here. 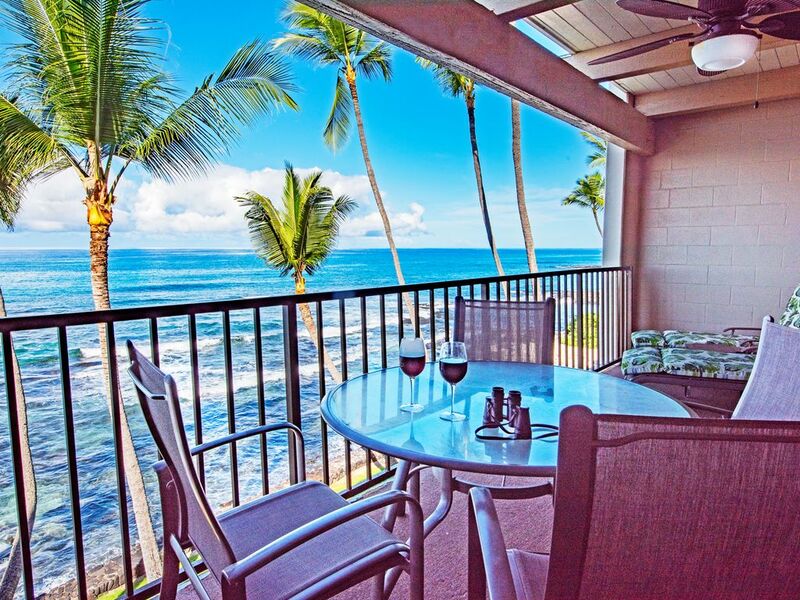 The ocean front view was wonderful and we enjoyed so much our time on the sizeable, comfortable lanai. Right in front of us, local surfers launched in early morning and afternoons to surf right off this beach - it was a lot of fun to watch! We also saw whales breaching in the distance. And turtles in the tide pools in the lava rocks. The condo was perfect for us. There are many kitchen supplies and appliances - it is very well equipped. The condo is very nicely appointed and lots of towels and supplies. We definitely recommend this as a wonderful place to stay and the owner Liane was very responsive and wonderful to communicate with. We hope to return here very soon! We were blown away when we saw how close the condo was to the big breaking waves! We couldn't have asked for more. We fell asleep every night with the sound of the waves. We watched surfers every day, watched the turtles in the tidal pools and could see bright yellow fish even from our lanai. The condo is decorated very nicely with tropical fabrics and colours and it was a lovely place to come home to after a trip to the Crater or excursion to the north side of the island. Liane's book about the Big Island has so much info we used it every day. We had most meals on the lanai but when we were in the village our favourite restaurant was Lava Java. Super delicious food - especially breakfast! The Kona Inn restaurant with their big wicker chairs has a genuine Hawaiian feel and it's a must-see. Our two weeks went way too fast but we'll be back, hoping to rent Liane's condo again! The colour of the ocean was so beautiful! Great location close to Ironman and a beautiful view! Stayed here while we were in town for Ironman and it worked great. Nice and close to town. Great views every day and a nice little beach area and shallow pool area in the ocean , right out back. I loved the setting of this property. This was the second week of my stay in Kona. As a lifetime asthmatic, I was a bit worried about the VOG from the volcano. I had no difficulty with breathing while staying. Being right on the coast, there was always a breeze blowing the VOG away from the condo. I travelled around the west and north sides of the island enjoying nature and attractions without any effect on my health from the volcano. Don’t be deterred. Kona is as beautiful and restful as ever! Paradise! Thanks so much for letting my guests know that as an asthmatic you had no difficulty breathing the Kona air. I know many are not booking because people are listening to the mainland news making it sound like the whole island is affected. That couldn't be further from the truth as the volcano is 100 miles from the volcano. This would be a great time to go and book a helicopter ride to see the lava, waterfalls and so much more. Thanks again. My Hawaii Vacation Rental is at the Kona Bali Kai Condo complex, 2 1/2 miles south of the quaint town of Kailua-Kona which has numerous shops and restaurants that line the beach. This is unit 204, but I also have an identical oceanfront VRBO listing #48663 in the same complex. Check that listing number to see if your dates are available, if this unit is booked. Within walking distance only 1/4 mile north of the condo is Alii Gardens Outdoor Marketplace where you will find local arts and crafts and local farmers produce. Great place for shaved ice! Right next door to the condo is a well known Banyans surfing beach where local surf, boogie board, long board surf and even do kayak surfing. From sun up to sun down it is fun to watch the surfers from the condo lanai. Two miles south of the condo is Kahaluu Beach Park which is one of the best snorkeling spots on the Big Island. Fed by a fresh water spring, up to 10 million gallons per day. These shallow waters are almost always calm, with colorful corals, rock formations, and 100+ species of fish. Swim with schools of colorful fish & green sea turtles in protected waters; don't forget your underwater camera. Things to do on the island: Boogie Boarding, surfing, body surfing, ocean swimming, kayaking or kayak surfing, long board surfing, lava tube exploring, hiking to lava and volcano, helicopter rides over flowing lava, horseback riding, luau with local food and dancers, golfing, sunset sailing or dinner cruises, submarine adventure, deep sea fishing, ocean rafting, kayaking, snorkeling, scuba diving or snorkeling with manta rays...just to name a few.